The woman, who was beaten by neighbors and strangers at her father’s invitation, was one of five speakers at a national housing summit hosted by the Corporation For Supportive Housing (CSH). Its mission is to end homelessness by constructing more affordable housing, and I proudly serve on the CSH board. Listening to individuals who have overcome adversities is always inspiring, regardless of the different types of barriers each of them faced. The five summit presenters were especially interesting to me because of the diverse paths that had caused each of them to become homeless. The woman, who was beaten as a child, described how she had later joined an L.A. gang, become pregnant, and ended up on the streets fleeing an abusive relationship. An immigrant told how she had come to the U.S. legally but through no fault of her own, had become homeless and only spoke a words of English. A third presenter described how he had been a drug addict for more than two decades. The last speaker had schizophrenia and became homeless because she was psychotic and convinced enemy soldiers were trying to kill her during a war that was only happening in her mind. All of the speakers were graduates of CSH’s SPEAK UP! Advocates program. Its co-founder, Ann English, explained why helping formerly homeless Americans tell their stories was so important. Through monthly workshops, one-on-one coaching, public speaking at community events and advocacy with elected officials, Speak Up Advocates develop skills to reclaim their lived-experience stories as messages of hope to create change. 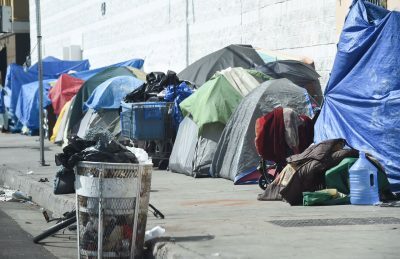 The CSH summit was held in L.A., the so-called “Homeless Capital” of our country with an estimated 53,000 homeless, many on its skid row. If you drive through skid row you will see third world conditions. The sidewalks are covered with tents and makeshift shelters. There are no bathrooms, no places to shower. Clearly psychotic residents can be seen yelling and wandering. Drug addicts and alcoholics slumber in the gutters. Dirty needles, human feces – you get the picture. In 2015, local, county and state leaders recognized the county and city were in crisis. Thankfully, CSH created a housing services financial model to assess what could be done. CSH showed billions were needed – that’s right billions. In July 2016, the state took $2 billion out of the so-called millionaire’s tax pool to help pay for supportive housing. In November 2016, voters in the city passed Proposition HHH, a $1.28 billion housing bond issue to create supportive housing. In Marcy 2017, voters in the county passed Measure H, a quarter cent sales tax increase expected to generate $335 million per year for the next ten years to fund services and permanent housing. Remember all of these public funded efforts were supported by voters and, one of the many reasons why, was because of individuals with lived experiences sharing their stories. Putting a human face on a social issue is one of the most effective ways to bring about change. Much the same as Speak Up, programs such as This Is My Brave and NAMI’s In Our Own Voice, give individuals with mental illnesses a public platform. You simply think differently about homelessness, mental illnesses and drug/alcohol addictions when you listen to someone who has endured, survived and overcome these obstacles. This is why it is so important for all of us, who care about reforming our badly broken mental health system, to tell our stories, and that includes parents.